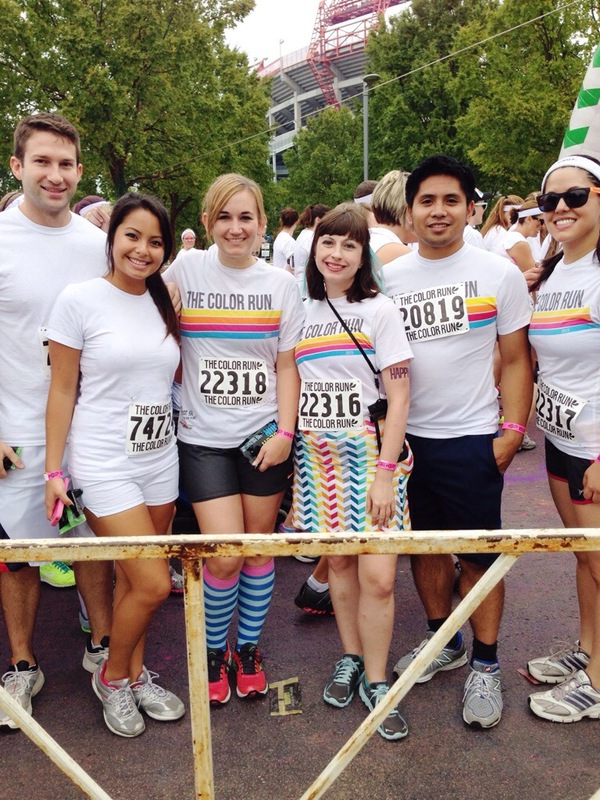 The Color Run is even more fun the second time around! 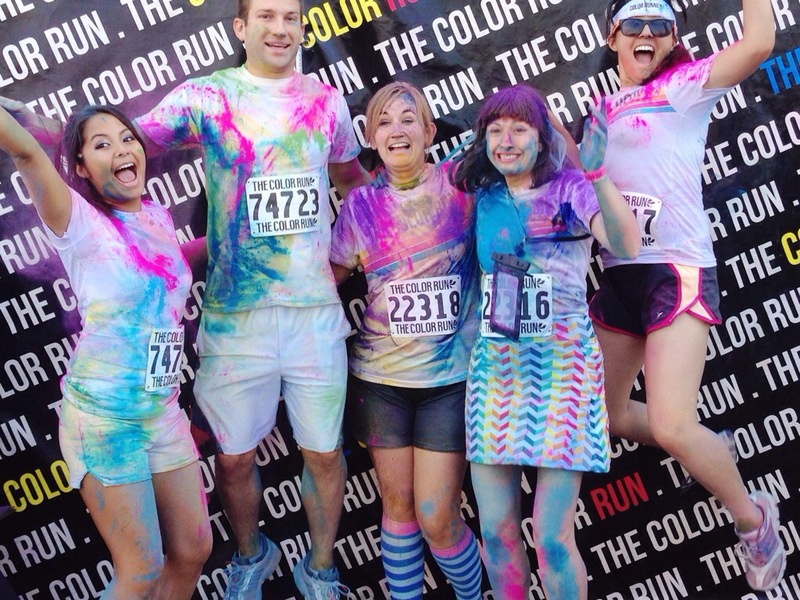 Since I had done the Color Run last spring, I knew what I was getting into and what I wanted to accomplish. I knew that I liked blue, pink, and purple (which all stay pretty vibrant), and I wanted to stay away from green, yellow, and orange (all of which I think have a tendency to make the colors look brown). I also had purchased a waterproof iPhone case, so I could bring my phone through for photos without worrying about it. My outfit choice was a colorful skirt from RunningSkirts paired with the same Color Run tee as last time. You can see how well the color washes out of it, since it had sat in my bathroom for over six months without being washed and then I washed it the day before the run for the first time. I also put some blue hair extension clips in my hair, from a faerie costume I made years back. Here’s our team’s before shot! We had signed up for the early 9am spot, but a few team members were running late, so we didn’t get on the course till 9:20 or so. It was the same course as last time, with the colors in roughly the same areas. The only real difference was that instead of orange being cornstarch, it was liquid, which didn’t matter much to me, since orange was one of the colors I was avoiding. We jogged along (or I jogged along while some of the team walked), but it started to get really awesome when we hit pink! 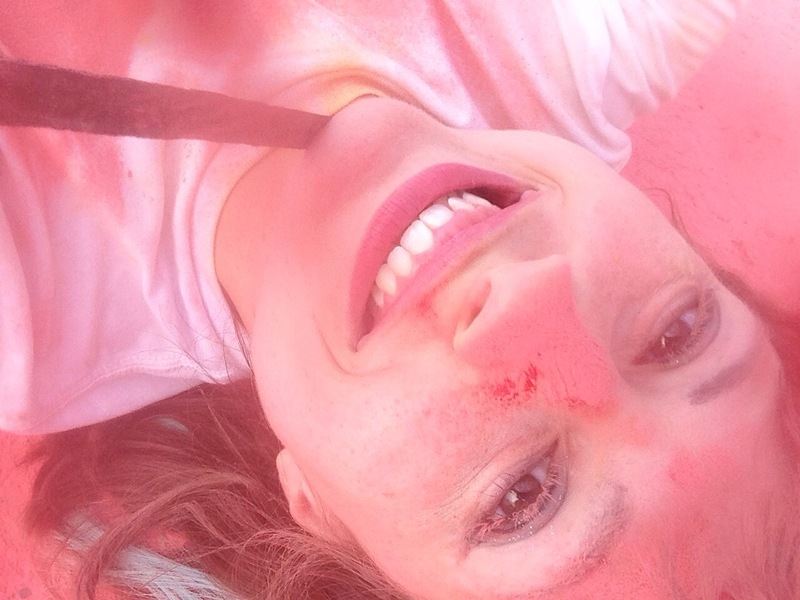 I even laid down to cover my back in pink (which mixed with the orange liquid that got sprayed on my back, formed a dark red…boo!). Then we made it to the blue, and I faceplanted (on purpose) to cover my front in blue. By the time we reached the finish line (a leisurely 45 minutes after we started), I was pretty well colored, but it wasn’t over. We still had our color packs, and Daniel had purple! I instructed him to dump some on my head. One disappointing thing about the fall’s run is what seemed to be a lack of professional photographers. There weren’t any even stationed at the backdrop like last time, so we had to get other people to take our photos. Luckily, they were people my friend Jessica knew, so I didn’t feel too bad about making them take 10 different jump shots. I think this was take three. I did manage to not inhale/ingest as much color this time, so after I took a bath (which turned out awesomely half-blue, half-purple), I didn’t have much issue with color turning up weird places over the next few days. Still love the Color Run! 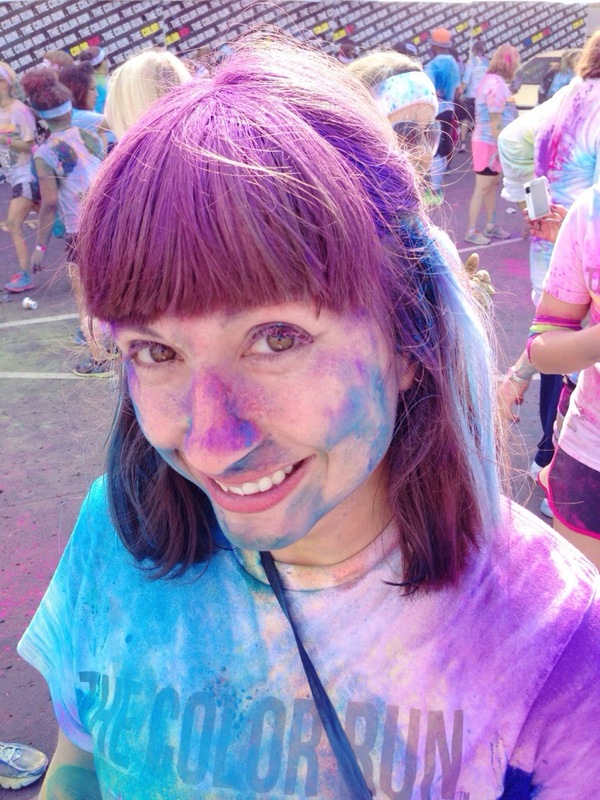 This entry was posted in Race and tagged fun run, running with friends, the color run. Bookmark the permalink.